Response to the floods have continued to fail the people of Sindh province as thousands are left stranded in this forgotten emergency. The poor farmer was devoted to the lively three-year-old: "I was always picking him up and playing with him. He was the baby of the family. I couldn't be without him for five minutes," he said. Now he is without him forever. Abid died from diarrhoea and gastroenteritis contracted from contaminated water. His parents had nothing else to give him. "We were drinking contaminated water and eating food washed in that water," Muhammad told me. "After that he started vomiting. We took him to the doctor, but he didn't improve." Muhammad is keeping the truth from his older son Hamid - now a lonely five-year-old. "When he wakes he asks for Abid," he said. "He asks again in the evening. I say 'he's gone to play, and he'll be back soon'." The stagnant flood water still surrounds him in Tharparkhar district, in southern Sindh. It is on both sides of the road where Muhammad and many others are living in crude shelters. Two months on, they don't even have tents. Muhammad's wretched settlement can only be reached by boat. In his area alone, there are 44 marooned villages. 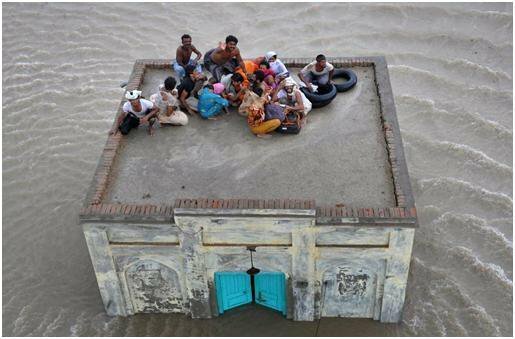 Parts of Sindh remain hostage to the floods. Our boat was carrying local men, returning from receiving aid at a United Nations World Food Programme distribution point. One of those going home with a month's ration was Allah Batchayo, whose name means "Saved by God". Once on dry land, he struggled under the weight of 30-kilo sacks of wheat flour and rice, but he is relieved to have supplies for his extended family of 15. Like many here, he said he could not rely on his own government for help. "It very clear that the ruling party gives preference to its own supporters when it comes to relief aid, "he said. That claim is borne out by local and international aid workers. One seasoned aid official told BBC News that ruling party politicians and local officials often tried to control where aid was distributed, favouring their chosen villages. "It happens a great deal," he said, "but that pressure is resisted." The major problem for aid agencies, however, is that there is so little assistance to go around. The international response to the floods disaster has been sluggish at best. "Pathetic" was the verdict of one aid worker. The reaction from donors had been an "ominous silence", according to the International Committee of Red Cross and Red Crescent Societies. Veteran aid worker David Wright, Pakistan Country Director with Save the Children, said it was the worst he had ever seen. "I've been in this game now for 15 years," he said" and I've never seen a response that has taken so long to get off the starting blocks. These people have lost their homes and their livelihoods. It's bigger than the tsunami." But the response is not. The United Nations says more than 5 million people are struggling to survive without adequate food, water, shelter or medical supplies - but its appeal for the victims is only 20% funded. That could mean that relief supplies dry up fast, said Robin Lodge, of the UN's World Food Programme. "We've got enough for the next few weeks," he told me. "After that no funding, no operation. We would have to stop and that would be catastrophic. We cannot invent resources." Aid agencies said major Western donors were not digging deep because of the economic downturn. They also admitted that there were concerns about corruption and bad governance here and worries about how their money was spent after last year's epic flooding which affected more than 20 million people across Pakistan. The former head of Pakistan's National Disaster Management Agency, General Nadeem Ahmed, claimed recently that 5bn rupees donated last year had not been spent by March this year. A government official denied that donations had gone unused and suggested there might have been an accounting delay. Pakistan has been described as a "bad brand" by one diplomat. That may be so. But if donors don't give, it is the country's poor not corrupt politicians or officials who will pay the price. Darshi, a labourer from the minority Hindu community, knows his daughter Jammi is alive because of foreign help. He has the calloused hands of a man who battles every day for survival but when the floods destroyed all he had, he could not afford food for his daughter. We last saw the malnourished 14-month-old 3 weeks ago. At that stage she was so weak she couldn't even swat away the flies that lingered on her face. After a brief stay in a flooded local hospital she is back by the roadside in the district of Mirpurkhas. Thanks to high protein food aid, she is lively and alert. But although Jammi is much stronger, she is still at risk from the contaminated water, just steps away from her tent. "Where can we go?" Darshi asked. "We have to stay here. The water is polluted. At night we get bitten by mosquitoes. Sometimes we get relief aid. Sometimes we don't." Jammi has just started to walk. During our visit she took a few steps into the waiting arms of her proud father - the bells on her ankle bracelet jingling as she moved. But if food aid runs out, her fragile recovery could be reversed. And other young lives are at risk, if the world keeps looking the other way. Aid workers are warning that this could become a forgotten emergency. Many flood victims believe it already is.